A lot of what was said in May about caring for the lawn still applies in June. 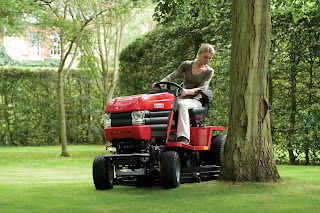 A new lawn is best started in August to September, so continue to prepare the area and complete any deep cultivation. Give existing lawns the last treatment of lawn sand and weed killers that destroy broad leaf weeds. Watering can be important but with hosepipe bans and periods of drought you need to do what you can to help the grass. Whilst reasonably drought tolerant, prolonged dry periods will make the ground hard and difficult for water to penetrate. Spiking will help, as will mulching by raising the mower blades in dry weather and instead of collecting the grass, leaving it as moist cuttings to act as protection. A purpose-built mulching deck on the garden tractor will be just the job. Fine fescue and bent grasses that make the finest lawns are less susceptible to dry weather. When you do water, water well. Give the lawn a good soaking a couple of times a week rather than light spraying every day, as too little will only lead to shallow rooting and encouraging weed. What you’re doing is getting the deeper soil wetter and as it dries out on the top the finer grass roots push deeper to find moisture. Shallow rooting grasses you don’t want, like annual meadow grass, will struggle. Keep edges trimmed for a neat appearance using a powered edger or attachment for your trimmer if you have one. Continue to mow regularly but keeping the above in mind.